Because the Atlantic lionfish has no predator, they are surprisingly easy (and fun!) to hunt. The lionfish is a stalking hunter, they usually sit motionless looking like a soft coral with their long spines gently flowing in the current and move very slowly towards their prey. They have large mouths which are capable of opening wide enough to swallow a fish almost as large as themselves. Lionfish have been found with as many as 20 small juvenile fish in their bellies! The lionfish also likes to sit on or near the bottom. They like structure, and will often be under a ledge, on a rock, or sitting next to a piece of structure. Having never feared for its life from a predator, the lionfish will sit still and let divers approach it. Once it feels the sting of a stainless steel prong however, the game is on and the lionfish will seek a safe hole to hide in. The lionfish’s lack of fear is what allows the diver to get so close with a polespear or sling for a clean shot. There are many devices available for hunting lionfish, and some people feel a polespear is the best tool because it can be shot and handled with one hand, allowing the fish to be bagged with the other hand while handling the lionfish on the end of the pole spear. Once the lionfish is spotted, load the band on your spear and approach the lionfish as close as possible with the tip of the spear. The lionfish will usually allow you to put your tip as close as 3-4 inches from its head. Then release the band. Always aim for the head, it’s large because the lionfish has a huge mouth, and it’s much tougher than the delicate white meat and will hold on the spear better. 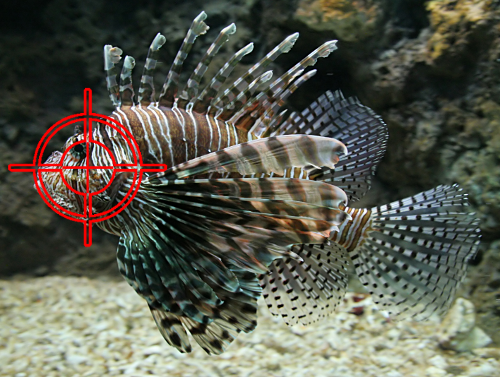 Just like when you are shooting anything else, please be aware of what is under and behind the lionfish so that you don’t damage the reef or any corals. They are often over sand around a coral head, and when possible it’s best to shoot with a downward angle to pin the lionfish to the bottom and ensure good penetration with the spear tip. The next step is to bag the lionfish. 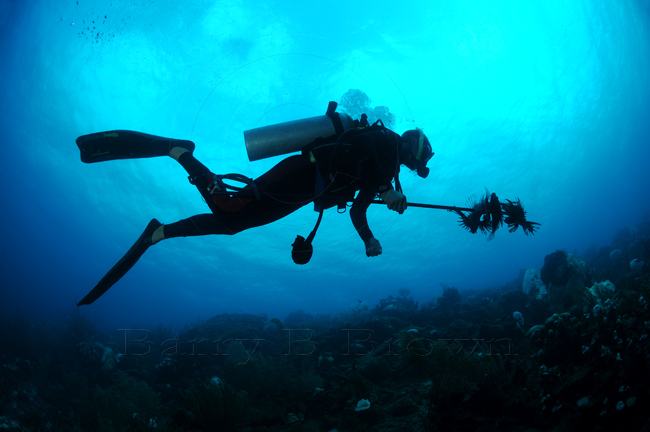 With our lionfish holding bags, it is easy to slip the lionfish head first into the bag and then pull the spear back out, shaking the lionfish into the bag. The bag is very tough and resistant to the spines, but always use care when handling any bag of lionfish, as the spines are stiff and may punch through any material. There is a flap or valve on all of the lionfish catch bags which works like a typical lobster bag and is essentially a one way valve. The lionfish goes in, but can’t swim back out. Back on the surface the lionfish can be dumped out for cleaning. Please refer to our page on how to fillet and clean the lionfish for further instructions. Remember, every lionfish female can release up to 2 million eggs each year! By helping to remove the invasive lionfish from the reef you are saving our grouper, snapper, and other native species for future generations.